This was such an emotional story. There were parts that were touching, others that were devastating. This book ran rampant over my emotions. I really felt for Sam and Jacob. I didn't expect the twists that were thrown in! The things these kids have to go through and the love that they show for one another was amazing. Get the tissues ready before you sit down with one. If you are looking for a light read, this isn't it. 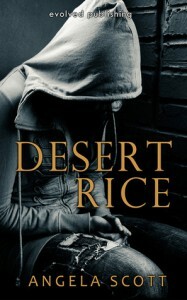 There are some heavy subjects dealt with in Desert Rice. But, I loved it! I was again devastated when it ended. I wanted more. No, I need more! I gotta know what comes next for Jacob and Sam. This book will stay with me for a long while. Angela Scott did an amazing job creating these characters and pulled me right in. Book two comes out in January 2013.I received this book from the author/publisher/tour company in exchange for an honest review.